The first 0-0 of the World Cup means both Denmark and France will be playing in the round of 16. 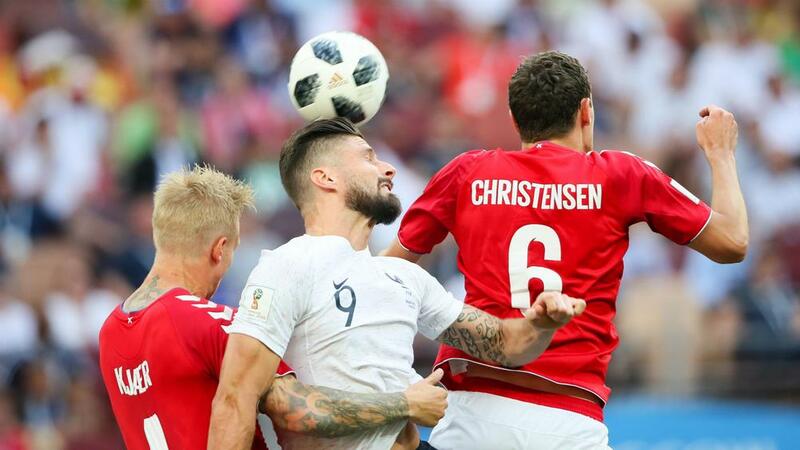 Denmark followed Group C winners France into the last 16 with the first goalless draw of the 2018 World Cup against Les Bleus at the Luzhniki Stadium on Tuesday. France had already qualified and Denmark needed a point to be certain, although a 2-0 win for already eliminated Peru against Australia sent them through regardless of their result. Didier Deschamps, marking his 79th game in charge to level Raymond Domenech's France record, rested key players such as Paul Pogba and Hugo Lloris and kept Kylian Mbappe on the bench for the majority of the game with an eye on their knockout campaign. Deschamps' six changes contributed to a lack of cohesion that prevented France from ending the group stage with maximum points for the first time since they won the tournament in 1998, Antoine Griezmann struggling to link with partner Olivier Giroud. After topping Group C thanks to a dull draw, France are on track to face Argentina in the first knockout round if Lionel Messi can inspire his side to victory against Nigeria, who occupy second spot in Group D.
Giroud and Raphael Varane sent early efforts off target as news of a Peru goal in Sochi reduced the pressure on Denmark. Ousmane Dembele bent a presentable opportunity wide as a low-tempo match continued to await a shot on target. And when it finally arrived in the 38th minute the strike from Griezmann was straight at Kasper Schmeichel and easily dealt with by the Leicester City goalkeeper. Griezmann set up Giroud, but a late offside flag spared the blushes of the striker - scorer of Les Bleus' last three goals against Denmark - after he blazed over the crossbar. Steve Mandanda became France's oldest World Cup debutant and the goalkeeper almost cost his side, spilling a long-range Eriksen free-kick before recovering to claim the loose ball ahead of lurking striker Andreas Cornelius. Eriksen drilled wide in the 59th minute as Age Hareide's side took control of the contest, although France substitute Nabil Fekir rippled the side-netting with an ambitious drive shortly after his introduction for lacklustre Griezmann. Fekir hits it from distance but it hits the side netting. Fekir forced a smart stop from Schmeichel in the 82nd minute, while Giroud had a late penalty appeal rejected by referee Sandro Meira Ricci.